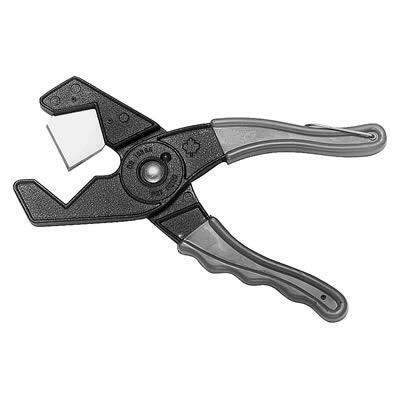 This high quality hose cutter provides a straight, even, clean cut on heater, air conditioning, braided rubber or plastic hose up to 1-1/8” dia. Designed to remove the rear hub when installing our 71520 and 71530 Series Volkswagen shim. This wrench is a must in assisting the installer when using these camber and toe shims. Designed to handle the toughest job, the 73119 is adjustable and has special forged jaws shaped to fit the job. Positive grip allows this tool to do many other pulling jobs. CAUTION: Not for use with impact wrenches (air tools). This special 10 point socket is needed when removing the O.E. rear lower control arm on new 2001 to 2006 Honda Civics, 2003 and up Elements, 2002 to 2006 CRVs and 2002 to 2007 Acura RSXs. Included with Part No. 69300 and 69400. This cutter, a must for properly cutting our patented EZ Shim, is a great tool for a variety of cutting needs. Its thin cutting blades help prevent breakage and waste. This puller removes front hubs on vehicles with independent front suspensions. Remove screw and use it with Flange Type Axle Puller to remove axles in compact cars. Flange Type Axle Puller can be used as a regular wheel puller or hub puller, as well as a flange type puller. The bolt circle range is from 4-1/2” to 5-1/2”, which covers all cars and small trucks with flange type axles. The four slots allow this tool to be used on 4, 5, or 6 stud designs. When used with the Flange Type Axle Puller, this tool will pull most CV joints that use a hidden snap ring to hold them in the transaxle. Made to remove the axle assembly without damaging the transmission case or inside roller bearing. This fluid lubricates the 85125 Rotary File Set, and the 68670 Rotor-Bor to reduce stress on the cutting teeth. This product is highly recommended to prolong the life of all cutting bits used on steel. Take the play out of front wheels during alignment! tires to assure a more accurate alignment. A must for Mercedes vehicles. An adjustable steel plate extends the length of the bar to put constant pressure on the brake pedal. A must for proper alignments. This tool securely holds the steering wheel and covered hooks and base prevent damage to the steering wheel or seat. 99750 is full floating with enclosed ball bearings. Large, easy to read dial is quickly adjusted to zero. Ideal for racks, pits, floor units or stands. have leveling adjustments. Sold in pairs. Portable stands allow technicians to perform alignments without an alignment rack. Use with 99884 Front Wheel Stands, all legs have leveling adjusters. Sold in pairs. With a total height of only 3/8”, these low-profile slip plates allow a 2 inch total movement of the rear wheel while adjusting camber and toe. Sold in pairs. Gives toe readings (in 1/32 of an inch increments) by measuring distances between marks scribed at the center of the tire treads. Comes with 8 ft. bar, 11 in. pointers, 5 in. stands, and 99516 scribe. This scribe is ideal for use with any style of toe measuring bar. The Universal Radial Run-Out Gauge displays exact measurements for tire, wheeel, and disc brake run-out. This gauge also measures ball joint and tie rod play and adjusts height to adapt to both auto and heavy truck applications. This is a great tool when measuring those hard to reach areas. Please refer to the Specialty Products Wheel Alignment Specification Book for ball joint specifications. Use this press tool to remove OE cam sleeves from Toyota trucks. The extended length forcing screw allows you to remove the sleeve without removing the steering rack. Recommend when installing our 25430, 25435 and 25440 replacement Toyota cams. Note: In some cases the tubes may be solidly corroded in place and even the Cam Extractor may not be able to break them free.